The below artworks are the most important by John Heartfield - that both overview the major creative periods, and highlight the greatest achievements by the artist. Artwork description & Analysis: This photomontage suggests the dynamic movement of the Republic automotive tire that runs over, crashes against, moves around emphatic slogans, ads, world news, and various Dada nonsense. The cut-out words and images drawn from newspapers, advertisements, and magazines are used to spell non-words, such as "DADA," and project the Dadaist outrage at the status quo (its rational norms and values), as seen in the shouting face of the dandy Raoul Hausmann in the bottom left corner of the montage. This Dada montage intended to playfully jolt the viewer to confront the contemporary moment of social and political crisis. Artwork description & Analysis: An oversized grasping hand energetically confronts the viewer. This popular 1928 election poster equates the five fingers of the laboring hand with the number 5 of the Communist Party's electoral list. On the morning of May 13, 1928, commuters, pedestrians, and all city dwellers would have seen this affective poster plastered throughout the urban areas of Berlin, and even on the front page of the Red Flag (Die Rote Fahne), Sunday issue, as readers opened the folded paper to its length. This image unequivocally urged them to vote the party's electoral list. It demonstrates how Heartfield used advertising techniques for the purpose of political persuasion to great effect. This symbol of the working hand was one among the many political symbols Heartfield produced that resonated with the working classes. Artwork description & Analysis: This self-portrait captures Heartfield in the act of "cutting off" with scissors the police commissioner Zörgiebel's head in a printed photograph. It is a literal description of his technique of gathering needed printed and visual material to construct his montaged-images. This is also a mock execution, a satirical critique of this police commissioner's ruthless policies - for example, the unprecedented police violence unleashed against the Communist demonstrators on May Day, 1929 in Berlin. Here in this mock-up of the montage, it is evident how the abutting images of Heartfield with scissors and the head of Zörgiebel are simultaneously hinged together and severed by the scissors. Heartfield intentionally aimed to show his technique and perform his social identity as an artist, as he conceived it in 1929. He designed this violent image for the well-established mass-circulating leftist AIZ. The image insists on being understood in pictorial terms due to the absence of any text. This self-portrait provides an opportunity to see his self-constructed visual utterance about himself and his artistic project to counter social injustice. Artwork description & Analysis: Heartfield personifies Germany in the cover image of the book Germany, Germany above All, as a composite figure: judicial and military costumes define his body, his face is statesman, nationalist, military, and bourgeois combined - as indicated by the loose joule below the chin and mustache, the red and white colors of the German Socialist Democratic Party, the military hat, and bourgeois top hat. Additionally, the words "Deutschland, Deutschland über alles," written in fraktur script, spill out of the figure's mouth, suggesting he is merrily singing the national anthem. The back cover reinforces the alliance between social and military order by juxtaposing the police's baton and the military sword. This montaged-cover together with the montaged images inside this picture book aptly characterizes how Heartfield's work was deeply immersed in a dialogue with the cultural crisis of the late Weimar Republic. Artwork description & Analysis: Heartfield's book jacket design for Upton Sinclair's book After the Great Flood: A Novel from the year 2000 (1925) visualizes a great wave swallowing a city. Heartfield effectively uses a montaged image of a tsunami-size wave and a skyscraper in the form of a single photograph across the front and back covers. It is simply framed at the top and bottom by a band of red, on which the author's name, the book's title, and Malik Verlag logo are printed. This singular image not only powerfully conveyed Sinclair's core message: the inevitable destruction of humankind by its own scientific experiments, but also Heartfield's clever use of a single image. Artwork description & Analysis: By wrapping this young man's head in the pages of the German Social Democratic Party's newspaper Onward (Vorwärts), this photomontage suggests that he has become blinded and even deaf to the reality that surrounds him. The caption reads: "I am a cabbage head. Do you know my leaves (which means both newspapers and cabbage leaves in German)? Whoever reads bourgeois newspapers becomes blind and deaf." Visually the body sits in undisturbed repose, expressing the person's frightful complacency with what he reads. This is suggested by allowing the text across his head to speak for him. As the art historian Sabine Kriebel noted, Heartfield plays on features of earlier studio photographs, such as the aureole that surrounds the body contours, while surface details stand out in sharp relief, to suggest long exposure (associated with such studio photographs) and the instantaneity of photojournalism (its snapshots of world events). Artwork description & Analysis: This photomontage reveals Adolf Hitler, the leader of the National Socialists, as orator, who speaks mere rhetoric or rather junk. Heartfield playfully integrates an authentic likeness of Hitler with an x-ray image of a torso, which exposes the ribs and esophagus, to show how Adolf, a gluttonous swallower of big industry's money, spouts meaningless words. Monetary exchange is made physically real and at once repulsive as it is presented in the abstract form of a digestive body, which symbolizes a system of ingestion and suggested regurgitation. 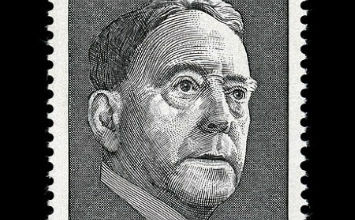 Heartfield's montage, published in the AIZ, preceded an article that examined the distinction between the anticapitalist rhetoric of the Nazis and their pro-capitalistic practices. It showcases Heartfield's play with fantasy and reality to provoke critical thinking. Artwork description & Analysis: This photomontage focuses on a white dove, a symbol of peace, impaled by a bayonet, symbol of modern warfare. The simplicity of this composition recalls the qualities of the "object poster" and draws attention to how Heartfield deployed advertising techniques to create an affective critical, yet emotional reading of this historical event. Published on the cover of the November 27th issue of the AIZ, Heartfield reacts to the Geneva disarmament conference that took place on November 9, 1932, as well as comments on the police's violent reaction against protesters who demonstrated against fascism in front of the palace of the United Nations. The conference's outcome revealed itself three days later in Geneva, when England, France, and Italy granted Germany equal military rights. Heartfield's montage simultaneously grasps the implications of the present action and anticipates the future in the form of a Socialist Surrealism grounded in the imagery of the 1930s.